Hindus around the world celebrate many festivals every year. When I visited abroad people appreciated saying ‘You Indians spend so much on weddings and festivals, it's awesome!’ I simply replied 'Yes, we love inviting guests with great hospitality so have grand weddings and all our festivals have different meaning, so we celebrate them with full of heart'. We will discuss about other festivals and weddings some other time. Here I would like to share some important information on why do we celebrate so many new year days. 1st January is New Year as per western calendar, which is celebrated by the whole world. Hindus love celebrations and we celebrate it in western style. Sankranti 14th January - Makar Sankranti is celebrated as first new year. Sankranti means transmigration of the Sun. On this day, Sun migrates from Aries or Mesha rashi, the first zodiac sign, so it's celebrated as New Year. However, there are 12 Sankranti’s in a year for 12 zodiac signs. This is also known as festival of farmers, they celebrate this festival as it is the time of harvesting. In Karnataka, Andhra Pradesh, Telangana, Maharashtra and Gujrat, it is celebrated as Sankranti. In south, people celebrate it by drawing Rangoli in front of the door and decorate the doors with mango leaves, preparing rotti /bhakri (round bread made from Jawar) and spicy mixed vegetables on Bhogi Day (a day before Sankranti), probably on 13th January. Sankranti day we prepare sweet dishes (as deserts after previous day spicy food) and exchange Tilgul (Sugar balls) as a sweet harmony of relationship for the whole year, fly kites in the sky. In Tamil Nadu, its addressed as Pongal, celebrated with sweet dish prepared by rice which is also known as Pongal. Odisha, Bengal, Assam also celebrate this festival as per their solar sidereal calendar. And, at the same time Punjab celebrates Lohri, by lighting fire in the cold temperature and dancing around to celebrate the passing of winter as it is the shortest day and the longest night of the year. Ugaadi / Gudi Padwa - It is celebrated as new year in the beginning of Chaitra Maas(month), Mid-March to Mid April, it is a first month as per the Samvatsar (Vikram Samvatsar calendar details written in my book- Amazing Legends of India) calendar. It's a Luni-Solar calendar considering position of moon and sun. This festival is celebrated as Yugaadi or Ugaadi in Karnataka, Andhra, Telangana. And in Maharashtra it is known as Gudi Padwa. As other Hindu festivals people draw Rangoli in front of the door and decorate the doors with Mango and Neem leaves along with flowers. 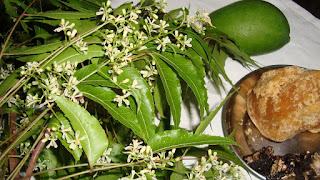 People eat Neem and Jaggery together to forget all the bitter moments and remember the sweet moments of the year. The day begins with oil bathing, water soaked in neem leaves (logically for cooling the body temperature in the beginning of summer), followed by prayers and Puja. North Indians don’t celebrate this festival but on the same day they start Chaitra Navratri to worship goddess Durga for nine days and nights (Other popular Navratri is celebrated in Dussehra during the mid-October to mid-November every year) and they also eat Neem and Mishri (rock candy). 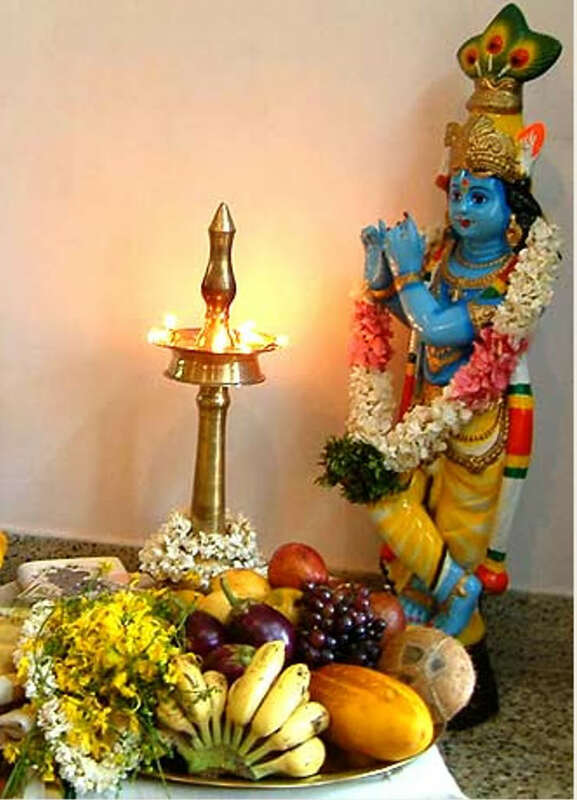 Vishu- Another New Year festival celebrated in India by the people of South coastal region, Kerala and some people of Tulunadu (South Karnataka coastal region). Vishu is all about buying new clothes, tradition of giving money and preparation of feast with equal proportions of salty, sweet, sour and bitter items as an offering to the almighty Lord Krishna. 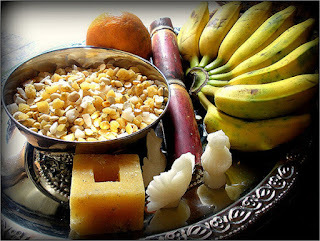 People also offer various fruits and other sweet items to the almighty for prosperity. Fire crackers are also most important part of this festival, in the morning and in the evening, children enjoy setting off firecrackers. This festival is celebrated according to Malyalam calender Medam usually in the second week of April every year. Puthandu Vazthukal- Tamil New Year. Pana Sankranti- Odia New Year to the people of Odisha. Ronagli Bihu celebrated new year by the people of Assam. Meitei Cheiraoba for the People of Manipur. Narak Chathurti - to celebrate the victory of Lord Krishna on evil king Narakasur, krishna freed 16000 women who were imprisoned by Narakasura for his evil deeds, all of them married Shri krishna on that day, so women does aarti to their husband as worshipping krishna. Puja of goddess Laxmi - is done on the third day of Diwali, which is also known as Goddess Laxmi's birthday, she emerged from Samudra Manthan on this holy day. Businessmen start new account of the year on this day, to please the goddess of good luck and prosperity, thus it's also celebrated as new year. Fourth day is Bali padyami or Padwa, on this day Lord Vishnu has sent Asura king Bali to Pataal in his Vaman avatar, it's a day of sacrifice and finding goodness in giving. Fifth day is Bhai dooj, brothers and sisters celebrate this day. All these days, people take oil bath early in the morning before sunrise, do puja and prayers, wear brand new traditional clothes, greet each other with sweets and gifts. Elders bestow gifts to the youngers. Worship gods in the evening and decorate the twinkling lights and diyas around the house, windows, doors (Logically, its to keep the house warm during the cold days) and in the night and crackle the fireworks. These are some famous Hindu new year festivals celebrated in our country. I never knew about the festival of the new year but it sounds interesting that you people celebrate it with so much enthusiasm. Please share some more pics and details about the occasion and celebrations. Thank you for your comment. These are only New year festivals. However, there are hundreds of other festivals we celebrate apart from these. I would surely share few more pictures.